I'm now 13 weeks post my last relaxer touch up and I can't tell other than seeing and feeling how long my new growth is and the breakage I'm experiencing. 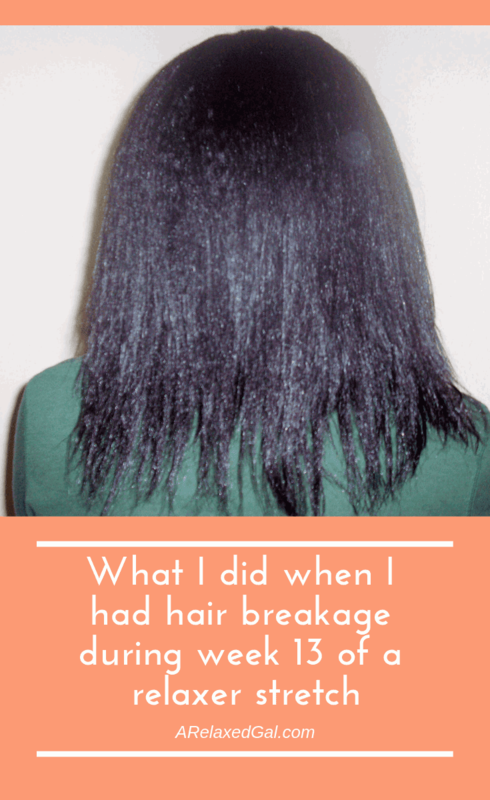 It's not a lot of breakage, but it's more than I've experienced in the past. I've been trying to pinpoint the issue and am thinking it might be a moisture imbalance, so we'll see what happens. I have a hair appointment with a stylist in Tampa later this month. 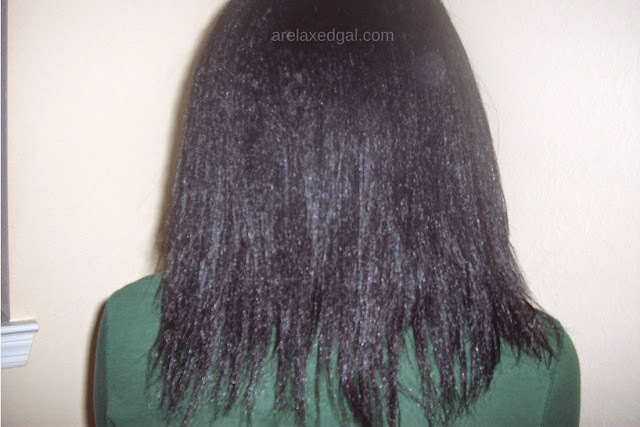 Maybe a relaxer touch up will help stop or at least lessen the breakage. Despite having some breakage, my new growth is behaving this stretch. I haven't had any serious tangling like I've previously experienced. Also, my new growth is staying pretty stretched between washes and it's not drying out. On the flip side, my ends have been drying out a few days after washing my hair. Even when I moisturize and seal my hair every other day. Since I'm having issues with breakage and dry ends I decided to pump up the moisture. I started late in the day and was feeling lazy so I didn't do a hot oil treatment for my pre-poo. Instead, I used Eden BodyWorks Jojoba Monoi Deep Conditioner mixed with a coconut milk based conditioner and wore my Hot Head Microwavable Deep Conditioning Cap for about an hour. After rinsing I shampooed with a macadamia oil shampoo. Then I applied green tea mixed with apple cider vinegar to my scalp with an applicator bottle. I then rinsed the mix out and applied L'Oreal Total Repair 5 Ceramide Conditioner and left it on a few minutes. My drying routine included wearing a t-shirt on my head for about 40 minutes, applying Nothing But Melted Shea Butter Leave-in mixed with grapeseed oil to my hair and blow drying on cool heat with my hand held dryer. After drying I applied Jamaican Black Castor Oil to the problem areas on my scalp. The result was stretched new growth, soft hair, and a non-itchy scalp. I'm not loving my ends right now. They're looking kind of raggedy. Also, I'm hoping that I'm able to keep my hair moisturized during the week and eliminate the breakage I've been experiencing. How is your relaxer stretch going? It seems like the winter brings a lot of breakage. I have the same problems too. I don't think that your ends look raggedy. They are probably just weighed down from the oils in your hair. It used to happen to my texlaxed hair all the time. So don't get too frustrated! How long do you plan to stretch for? Glad to share! Thanks for the encouragement. You could be right about my ends. I'll have to look more closely. Your ends don't look bad to me. 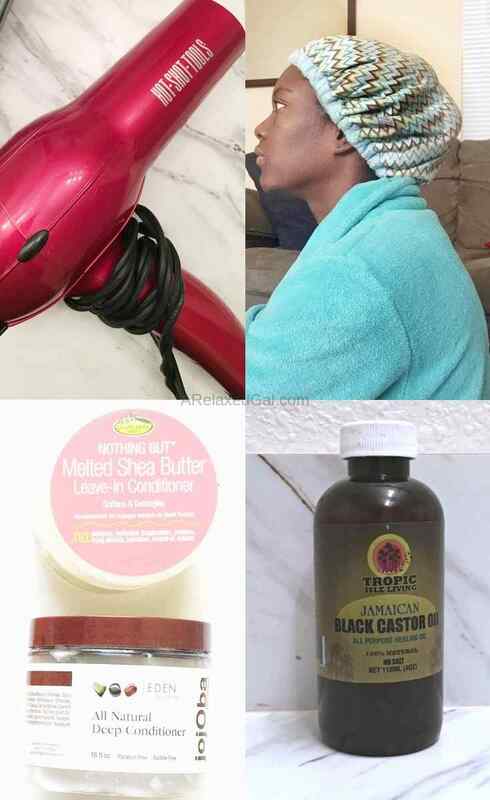 How long have you been using the Jamaican Black Castor Oil on your scalp? Where did you purchase yours? I have been using JBCO. I got my online from an ebay store. What have you been using to keep your new growth from not drying out? I struggle with this all the time when I am deep in my stretch! I've been applying Jamaican Black Castor Oil on my scalp and that has helped my new growth a lot. Also I've been able to keep my new growth from tangling which I think is helping the oils from my scalp to get down the hair strands. I was going to say the same thing. Your ends don't look bad to me. I think once you relax your new growth and straighten your hair, you'll see it even up a bit. My ends always look worse the deeper I get into a stretch. Hope you find a way to stop the breakage. Not all hair types do well with long stretches. If your hair grows fast 13 weeks might be enough. In stead of counting stretch weeks, measure the new growth and decide at what length there is enough new growth. It is not worth the extra weeks if the hair keeps breaking.